There is something about thunderstorms that brings out the creative muse in me. The rumbling, bumbling, rolling approach of a storm, the electricity in the air, all make my senses dance. I know there is a practical explanation for the physical changes an impending storm brings…but we here with the Goddess don’t always want practical. We want mystical! We want magical! We don’t want explanations — we want make believe. The power behind thunderstorms is magical all by itself. Combined with wind and pounding rain, thunder and lightning can destroy trees, people, and property. But I’m talking about the romantic side of thunderstorms. I live in the country, and I often can watch the storm approach. The scent of rain reaches out to touch me, water hitting dirt somewhere in the distance. The towering cloud tops in the distance sky slowly make their way towards my deck, their churning full of promise of the melee to come. 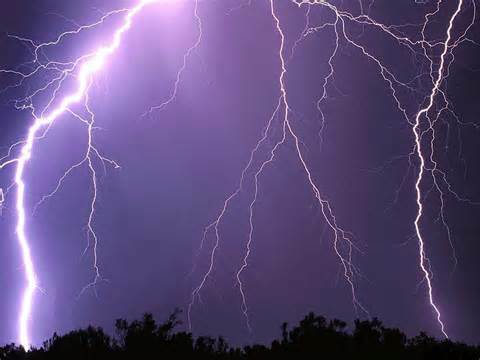 Thunder begins like a dog’s soft growl, but each growl gets louder, longer. Lightning begins to dance across the sky, its timing closer to matching the explosions in the sky. The storm makes its way across the field at a slow, steady pace. I once sat in the barn and watched the wall of rain make its way across the field, eventually making its way to and over the building. Once the rain hits, the atmosphere changes. Sometimes the rain is steady, the lightning and thunder steady as well. Other times the rain pours so fast you can barely see your hand in front of your face, lightning crack and lights the night sky, and thunder shakes the walls like an earthquake. Those are the storms history is made of. So here is this majestic storm making its way across my home this evening, and here is me, running around closing windows. Then it stops. I open windows. Another wave makes its way through the countryside. I close the windows. It stops. I open windows. I don’t move as quickly as the good old days, so there’s a lot of mopping up from Mother Nature. Suddenly this creative muse is a bit crabby because the storm blew over the plant in front of one of the windows and bent the screen on the patio door. The storm blew over the plastic chairs on the deck and I hear the flooding of the fields are incredible. So goes the romance of thunderstorms. I guess it just depends on the storm. And the clean up. I do! Keep on tapping into that energy! I live in the country too with a huge vista of the approaching storm and a tin roof on my house to listen to the downpour… love it!